A perfect mix of fresh herbs, lemon juice, feta, tomatoes and extra virgin olive oil spread over pita. This would make a perfect starter for your next meal! I love getting to explore the world in my kitchen. I may not have the time or money to get all of the places I'd like to visit in person, but trying another culture's food is a great way to get to know a little bit more about them. When Sue from Palatable Pastime suggested we do some Egyptian recipes, I was immediately intrigued. That is not a part of the world I know too terribly much about. Of course I learned plenty about the pyramids, mummies and hieroglyphics in school and I know a bit about the recent change of leadership. However I still feel like I know very little about the modern culture. Besides, I couldn't pass up the opportunity to use the #EatLikeAnEgyptian hashtag. I mean, that's a once in a lifetime opportunity! So I did some digging to find recipes. It turns out that most of what I was finding wasn't that far off from some food we already love. I suppose it makes sense really. There were recipes very similar to my Morrocan Lamb Stew that looked lovely. There were also a lot of recipes that reminded me of Greek dishes. Being as they all border the Mediterranean it makes sense that they'd have similar cuisines. My to try file is brimming with chicken recipes that sounded amazing. In the end I decided to do something simple. Don't worry though, I'm coming back to some of those other ideas as soon as a spare minute wanders into my life. That's bound to happen eventually, right?! From what I was reading, spreads like this and a bean spread similar to hummus, called fuul, are common breakfast fare in Egypt. What a hearty and flavorful way to get the day going! 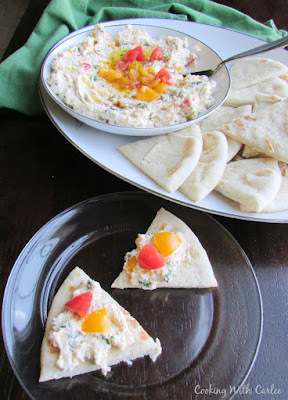 You can dip flatbreads like pita into it or spread some on and you're ready to go. It would also make a great appetizer and would be delicious on crackers as well. I love recipes like this that just use a few really simple ingredients so that each flavor really shines. It is also something you could pull together at a moment's notice if unannounced company comes knocking at your door. We all need to have a few recipes like that! My husband really loved this the most. He kept coming back for more until the bowl was licked clean! It really perfectly balances the briny cheese and fresh herbs. Plus it's just fun to eat! I can't wait to check out the recipes my friends put together. Now my curiosity about Egyptian cuisine is piqued and I can't wait to further my culinary tour! 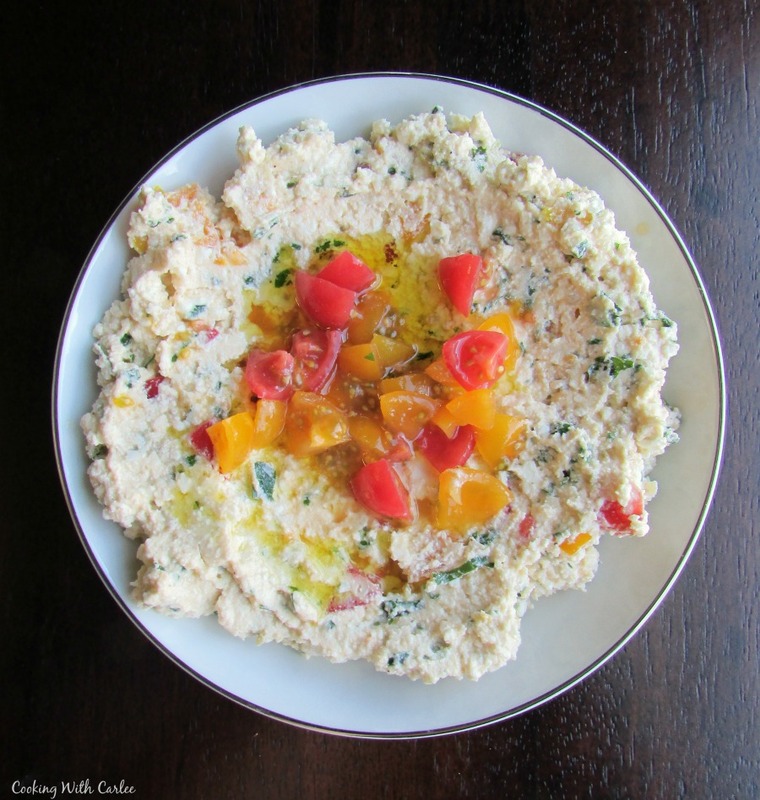 Mash the feta with a fork until crumbly. Stir in the olive oil and lemon juice and beat until creamy. Fold in herbs and tomatoes. Serve with pita bread and topped with additional oil and tomatoes. Today we are having fun exploring our favorite Egyptian cuisine recipes to commemorate the holiday of Eid-el-Fitr, which begins at sundown. I think so too! We should do more ethnic themed meals for family dinners! This would be fun to make along with Karen's Aish Baladi! Wouldn't that be great together? Sounds delicious - sure it would be great to snack on! That's how we had it and it was lovely! Very delicious sounding Caroline and I agree with Mommar...think how much fun it would be if we all lived close by and had an Egyptian party with all of these foods spread onto tables to try. I wonder what kind of beverages we would serve? Perhaps someone below you has posted one. This would be perfect with my flatbread!!! Wish we could get together! Wouldn't that be a perfect match? If only we could actually exchange dishes rather than only virtually! This sounds delicious. I buy the big block of feta fromCostco, so I am always looking for ways to use it up. I'm pretty sure that I have all the ingredients to try this, so I'm looking forward to it. I should totally buy feta by the big block! I hope you enjoy this! A perfect starter to your day or your meal. In my country we make something similar but with cottage cheese and eat is as a salad with grilled meat or roast so I know I would love this spread. We literally call it cheese and onion salad, lol. It's somewhere in my archives. I'll have to check yours out! I never thought about how much the flavors and dishes would overlap, but I guess it makes sense. As the crow flies, it really isn't that far away. It's probably closer than from us to California, just a lot more borders to cross! This looks amazing, Carlee! Thanks for sharing it. We should really have a real dinner party with all of these recipes. Wouldn't that be great! It would be a delicious meal, that is for sure! Gorgeous appetizer! Thanks for joining me in this event! Thanks for hosting, Sue! This was a fun one! This sounds really good. I love it when my hubby likes something I make for the first time. Also maybe one day you will get to visit those mummies and you will know what kind of food to order! Wouldn't it be fun to go see the pyramids?! And of course try the food! That is one of my favorite parts of traveling! Yum!! I would love this for breakfast - or anytime! Me too! I could eat cheese around the clock. And with toasty bread? Even better! Hi Carlee, we love feta and eat far too much on a weekly basis. This time of year it's mainly on salad so I figure it's not so bad! 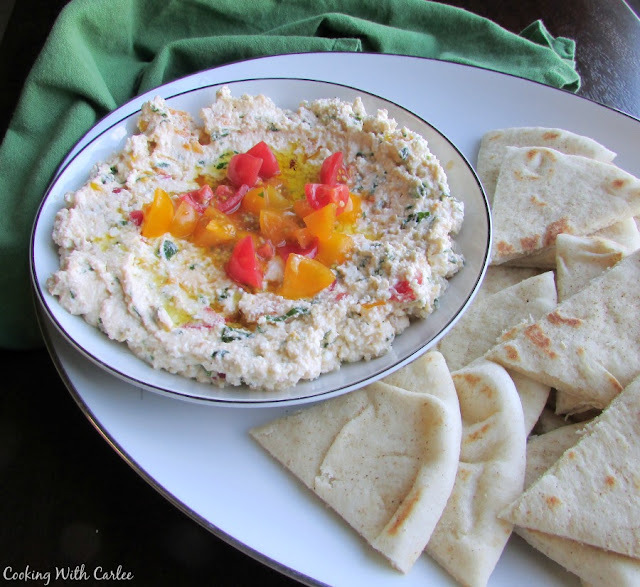 I don't think I've ever made a dip of it, so this is another recipe I have to try. Being quick and easy to knock up, it's perfect for this time of year. Mmm, I love feta on salads too. You'll have to let me know what you think if you try it! I'm glad you tried Egyptian, because now I will have to try this recipe! My sister and her family are on their way for their yearly visit, and I always struggle for recipes being the whole family is vegetarian. This will be a hit! I hope you all love it! My boss is vegetarian and it does take some thinking to please the meat eater the the vegetarians all at once! Good luck and have fun!